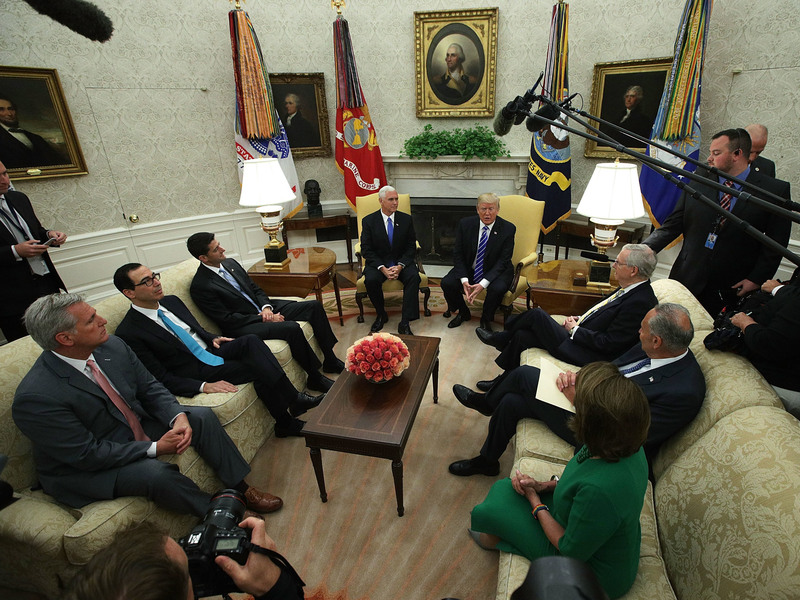 President Trump meets with congressional leaders in the Oval Office at the White House on Sept. 6. The deadline to fund the government and raise the debt ceiling is coming up on Dec. 8. It’s back to work this week for President Trump and Republicans after Thanksgiving — and they have a lot to do. Remember when Trump made that deal with “Chuck and Nancy” to avoid a shutdown and raise the debt ceiling? Well, the deadline to fund the government is again fast approaching. Trump and congressional leaders have less than two weeks — until next Friday, Dec. 8 — to get it done. And this week begins a big push. That means there’s a lot to do in a very short time, and the stakes couldn’t be higher for Republicans. Just four days after the shutdown deadline, it’s the Alabama Senate race. And the Democrat there, Doug Jones, has at least a 50-50 chance of winning. From NPR’s Arnie Seipel, deputy political editor: Possibly overshadowing Republican progress on taxes is the fallout from sexual harassment allegations against two highly visible Democrats, who both say they will not resign their seats. Soon after House Minority Leader Nancy Pelosi, D-Calif., declined to say whether she believed women who have brought allegations against Rep. John Conyers, D-Mich., her office announced he would step down from his post as the ranking member of the House Judiciary Committee. Pelosi’s initial responses in an interview on NBC’s Meet The Press begged for some cleanup, though a Democratic aide told NPR’s Scott Detrow that efforts had previously been underway to “lay the groundwork for him to step aside gracefully.” Conyers still denies the allegations against him. Sen. Al Franken, D-Minn., will return to work, and he is vowing to regain the trust of Minnesota voters after allegations that he inappropriately groped women during photos. Those followed the allegations by a woman who did USO tours with Franken and said he forcibly kissed her. Franken was also photographed groping her breasts through a flak jacket on a cargo plane. Franken told Minnesota Public Radio over the weekend that he was “ashamed” seeing that photo, but it remains to be seen how willing his colleagues are to accept his response in the current climate surrounding sexual harassment. More shoes could drop, too. The House is set to make harassment-prevention training mandatory for all members and staff with a vote on Wednesday. Rep. Jackie Speier, D-Calif., who has been leading efforts to reform the reporting process for victims on Capitol Hill, says that the two current members she said she knows of who have been subject to a “review” over such allegations have still not been revealed publicly. Does another shoe drop this week in special counsel Robert Mueller’s investigation into Russian election interference? The New York Times reports that Michael Flynn, the former Trump national security adviser, may be close to a deal or cooperating with Mueller’s team. The Times reports that Flynn’s team has ended an information-sharing agreement with Trump’s lawyers. Trump’s lawyers are trying to downplay that as likely meaning Flynn is about to plead. Of course, that’s the best-case scenario for Trump. The alternative — that Flynn is cooperating — is not what Trump’s team wants. Flynn isn’t someone Trump’s team can dismiss as a minor player. He was essentially Trump’s top foreign policy adviser and with him throughout the campaign. If Flynn has flipped, that could spell trouble for Trump because it means he is not the end of the investigation but the beginning. Flynn’s lawyer, when contacted by NPR, had no comment. We should remember that Mueller has proved he knows far more than has leaked and has already shown that he has surprises up his sleeve. Trump to campaign with Moore? By the way, President Trump teased that he might campaign with Roy Moore, the scandal-plagued Republican in the Alabama race. “I’ll be letting you know next week,” Trump said before leaving for the Thanksgiving holiday in response to a reporter about whether he would campaign with Moore after giving what amounted to an endorsement of him. We will watch for that, but this president has a history of saying “we’ll see” or teasing that something will come in a week or two … and then it doesn’t. Trump also teased that he would come up with a decision this week possibly reversing his administration’s lifting of a ban on bringing back big-game trophies from Zambia and Zimbabwe. It was a prime example of Trump being influenced by conservative commentators and cable news, as the Washington Post’s James Hohmann noted. Republicans can lose only two votes in the Senate on the tax bill. They already passed it out of the House, but there are several senators not completely sold yet, and balancing all of their disparate wants and needs might not prove so simple. Not helping the GOP’s cause is that they’re fighting an uphill battle when it comes to public support — a Quinnipiac poll found a majority (52 percent) disapprove of the GOP’s tax efforts. Just a quarter (25 percent) approve of the bills, both of which would permanently slash the corporate tax rate to 20 percent from 35 percent. That’s despite a group aligned with Ryan that has spent roughly $20 million on advertising and efforts to help pass the tax bill. A progressive group was later to the game but has now launched ads in states of vulnerable 2018 senators — or ones who might be wavering on the tax bill. Susan Collins, R-Maine: “I want to see changes,” Collins has said. What does she want? She wants the Affordable Care Act mandate repeal dropped; to keep the corporate tax rate 39.6 percent for the wealthiest; to make individual tax breaks last permanently. Currently they are temporary, and the corporate cut is permanent; she wants to make the corporate tax rate 22 percent and use the money to pay for reinstatement of the state and local tax deduction. Bob Corker, R-Tenn.: Corker is known as a deficit hawk. He is among a few other senators who are working to squeeze what they believe is a more honest estimate for how much the bill will actually cost. It is about $1.5 trillion now, but that’s with the individual cuts calculated as temporary. But there’s a strong likelihood they are made permanent after they expire. The Bush tax cuts were temporary, too, but President Obama went along to make them permanent. No president wants to be viewed as the one who raised taxes on most people. Corker wants a bill that “reduces deficits and does not add to deficits with reasonable and responsible growth models. And unless we can make it permanent, I don’t have any interest in it,” he said. Ted Cruz, R-Texas: He teamed up with Tom Cotton of Arkansas and Rand Paul of Kentucky to get a repeal of the ACA mandate into the bill. He is in favor of ending the state and local tax deduction but is concerned that eliminating SALT would be an effective tax increase on people in high-tax states. He would like to see the tax rates lowered enough so the deduction can be eliminated. Ron Johnson, R-Wis. and Steve Daines, R-Mont. : Johnson and Daines wants small businesses, and their owners who use so-called “pass throughs,” to see a bigger cut, on par with the 20 percent given to corporations. (Pass through is the term for how small-business owners pay taxes. The profits and losses of the businesses “pass through” to the owner.) The tax bills would lower the pass-through rate to 25 percent, but the small-business lobby wants it lower, and Johnson and Daines are working with them. There’s a difference here, though, between small-business owners and corporate CEOs. The small-business owners’ income is mixed in with business money. Corporate CEOs pay a much higher rate for personal income. John McCain, R-Ariz.: He continues to be focused on the process and wants senators to offer amendments. Lisa Murkowski, R-Alaska: The tax bill got a boost when Murkowski said she was OK with the mandate repeal being included. “I believe that the federal government should not force anyone to buy something they do not wish to buy, in order to avoid being taxed,” Murkowski wrote in an op-ed for an Alaska newspaper. She was one of three Republicans to vote against the various iterations of the GOP health care proposals. She didn’t say whether she was a “yes” on the tax overhaul, but the bill does include a section aimed at winning her vote — expanded oil drilling in Alaska. Murkowski has lobbied for decades to allow for drilling leases in the Arctic National Wildlife Refuge, known as ANWR. The tax bill includes a measure to allow those rights while raising roughly $1.1 billion dollars in new federal revenue. Rand Paul, R-Ky.: He’s a budget hawk but was one of the senators in favor of repealing the ACA mandate and making it part of the tax overhaul. An aide tells CNN that Paul is now likely to support the bill’s passage. But gaining Paul’s support could imperil Collins’ or that of others who aren’t in favor of the mandate being part of it.